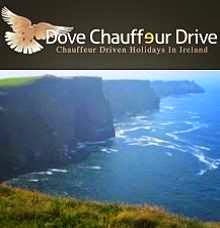 HOLIDAYS in IRELAND: The Wild Atlantic and Dingle on Chauffeurdriven vacation. The Wild Atlantic and Dingle on Chauffeurdriven vacation. Our day on the Dingle peninsula was spoiled a little by constant mist but our session with the baby lambs more than made up for that. As you can see, Nicole fell in love with her baby lamb, and it looks like the lamb fell for her also. Jill also had her turn. It is not very often that you get the chance to hold one of these babies. Stone was not to be left out, as you can see in this picture. The ancient beehive huts are always a must to visit. Here we have the full party at this beehive near Slea Head. The Dingle peninsula is my own personal favourite, but you do need good visibility to get a proper view of the spectacular scenery there. They did enjoy their day there though.